Cottages in the Cotswalds, Heart of England. We list a range of holiday properties in the Cotswalds on these pages. For neighbouring regions, try: the Forest of Dean, Warwickshire and Shakespeare Country, Shropshire, plus Herefordshire, Worcestershire, and the Midlands. From Holidaycottages.cc. 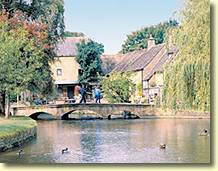 If you are looking for a quintessentially English holiday cottage then look no further than the Cotswolds. It is a beautiful area of rolling hills, country villages and small market towns. Do the Cotswolds have the prettiest of English villages? Many would say so, because the honey-coloured Cotswold stone, rough slate roofs and pretty cottage gardens combine with a higgledy-piggledy layout to make everyone's idea of the perfect English country scene. The area known as the Cotswolds is not a county but a region, technically following the line of an escarpment that forms the eastern edge the Severn River valley, the Cotswolds are generally considered to cover an area from Worcester in the north to Bath in the south. Gloucester and Cheltenham roughly mark the the Western edge and in the East the region stretches as far as Oxford and Stratford-upon-Avon. A typical Cotswold holiday cottage might be an old character cottage built of Cotswold stone and with a thick slate roof, don't expect too many straight lines in a place like this, but cottages will have been refurbished and upgraded so you can usually expect all mod cons. As the Cotswolds is a farming area, long famous for its sheep, there are plenty of old farm buildings converted to holiday cottages; also look for timber framed cottages and thatched roofs, particularly towards the eastern part of the region. As the Cotswolds are designated as an Area of Outstanding Natural Beauty, new developments are strictly controlled so even new holiday properties will generally be built of local stone and will blend with older cottages in style.